LODGE & SHIPLEY MODEL X, 20’’ X 120’’ HOLLOW CHUCK LATHE WITH 8 9/16’’ SPINDLE HOLE AND 21’’DOUBLE 4 JAW CHUCKS, 8-451 RPM. 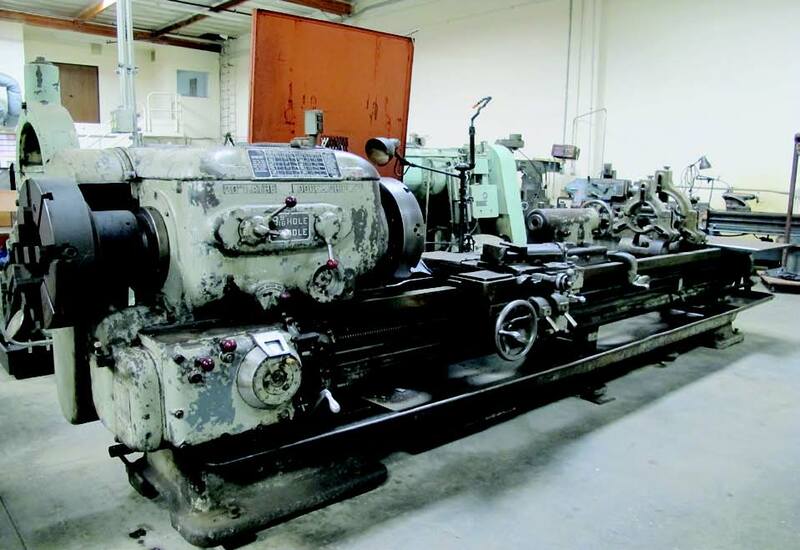 MONARCH 36NN, 42’’ X 84’’ ENGINE LATHE, 36’’ 4 JAW CHUCK, 6-303 RPM, 30’’ STEADY REST. SYDNEY 18’’ ENGINE LATHE, 25-1000 RPM, 12’’ 3 JAW CHUCK. WARNER SWAYSEY NO. 3-A TURRET LATHE, MDL 1950, 6’’ SPINDLE HOLE, 18’’ CHUCK 4.5’’ 3 JAW, TAPER ATTACHMENT. CINCINNATI 15-VC-200 CNC VMC, 40 ATC, ACRAMTIC 850 CONTROL. OKUMA GCU UNIVERSAL OD/ID GRINDER. POLAMCO FWA32M, UNIVERSAL MILL WITH VERTICAL HEAD. MAX O 6 X 18 SURFACE GRINDER. EXCELLO 602 VERTICAL MOLL WITH DRO, VAR SPEED. HYDRAULIC PRESS, BENCH GRINDER, DRILL PRESS. LARGE SELECTION OF METAL PIPE, FITTINGS, COUPLINGS AND SUPPORT. WELDING POSITIONER, WELD TABLE, LINCOLN 400 AMP TIG WELDER. LARGE SELECTION OF DRILLS, CUTTING TOOLS, AND SUPPORT. ARIMA 18FT BOAT, 90HP, 2 CYCLE WITH TRAILER.